Snyder's story starts with 2 Hollywood girls in 1925, then flips back and forth between then and the 1880s/'90s and early 1900s, which is fan-damn-tastic. I read it on my lunch break at Starbucks and it was riveting. Are there a couple of dumb plot points? YEP. But there's also a lot of fun stuff moving the story forward, and some issues are written by Stephen King, so if he floats your boat, there's some bonus info for you. Would've been 4/5 until the dumber plot points happened, which made it a Goodreads 3/5. 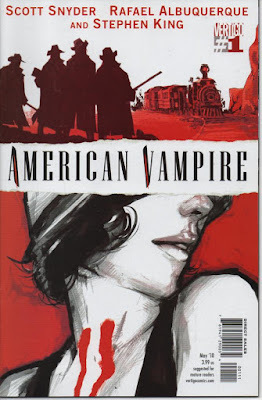 But I'm still totally checking out the next volumes, OF WHICH THERE ARE MANY, because The Past + vampires is almost always a winning combination. This was Twilight's main fault. Aside from the heroine having no personality and the hero stalking and emotionally abusing her. ASIDE FROM THAT. Just the fact it was set now. What's she wearing? Jeans and a hoodie. Great. Riveting. Sign me up for more. AMERICAN VAMPIRE HAS FLAPPER DRESSES. And also Old West hats. Read it if you like those things.